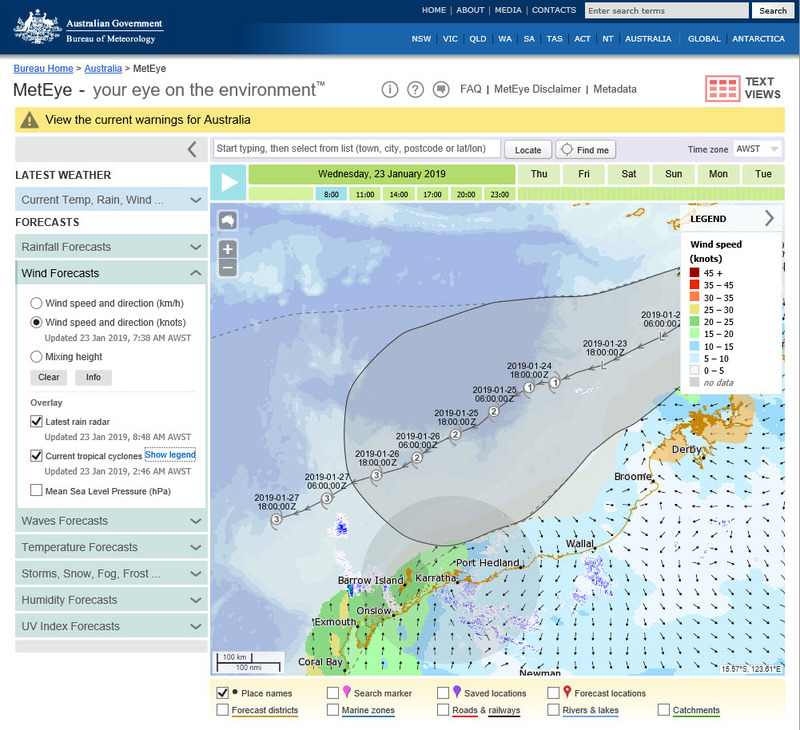 Cyclone Watch declared for the northwest Kimberley coast for a developing tropical low. Kuri Bay to Beagle Bay. Intensity: Tropical Low, sustained winds near the centre of 35 kilometres per hour with wind gusts to 85 kilometres per hour. Location: within 110 kilometres of 11.3 degrees South 125.9 degrees East, estimated to be 345 kilometres north northwest of Kalumburu and 490 kilometres north northeast of Kuri Bay. Movement: southwest at 16 kilometres per hour. The low is forecast to develop into a tropical cyclone during Thursday. Conditions are favourable for intensification as it continues to move southwest over water later in the week, parallel to the coast. If the system tracks closer to the coast, gales may develop along the northwest Kimberley coast. GALES with gusts to 100 kilometres per hour are not expected to develop between Kuri Bay and Beagle Bay, excluding Derby, for the remainder of Tuesday and Wednesday but may develop during Thursday afternoon if the system moves closer to the coast. Squally thunderstorms are expected. Locally heavy rainfall is possible. DFES-State Emergency Service (SES) advises that there are no community alerts at present. 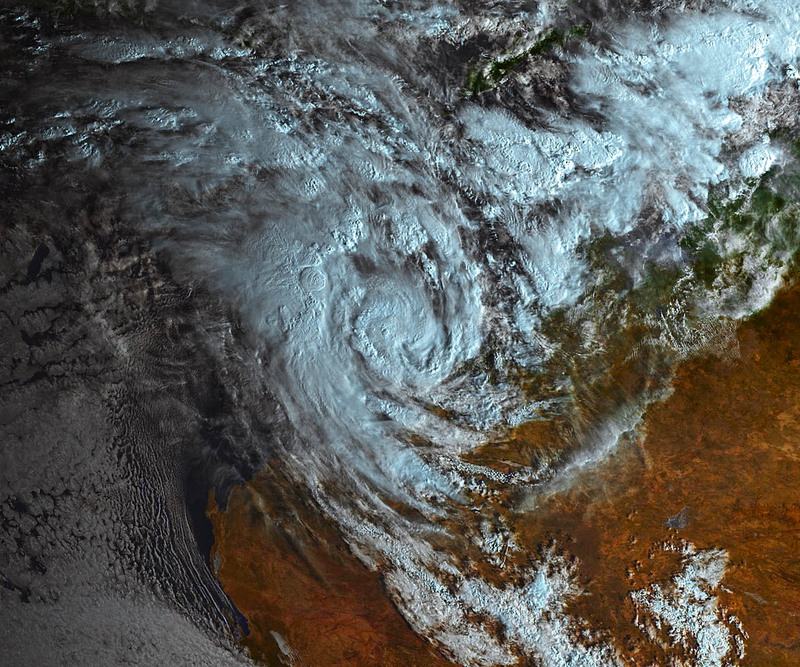 People in the Pilbara and Kimberley are advised to stay up to date with weather forecasts and warnings. People between Kuri Bay and Beagle Bay should listen for the next advice. People needing DFES assistance can call 132 500. In a life threatening situation call 000. For more safety tips visit www.dfes.wa.gov.au. The next advice will be issued by 9:00 pm AWST Tuesday 22 January. 94s at 0030UT today from Himawari 8 via Himawaricast off relay satellite Jcsat2B. Received by me. B5 - 1610nm mapped to red, B4 - 860nm mapped to green, Vis - 644nm mapped to blue. Colour adjustments in Photoshop. 1km per pixel resolution. Looks like,dough on the rise,great shot! Thanks for posting that meteye overlay Weathertgrl' . That was very interesting. Do you know what model meteye uses? Fabulous picture 'learjet' , we are all very privileged. 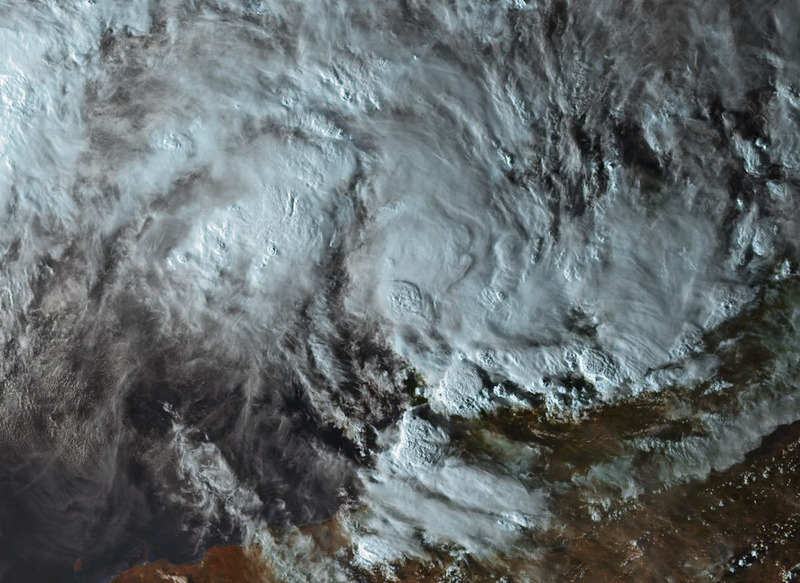 ACCESS G has the TC running down the coast toward Karratha but has not landfall . Instead take a more westerly track on ~late sunday 27th jan.
Access suggests the coastal regions are likely to feel some increased wind speed as the more severe outer closed isobars graze the coast. remains obscured by thin high cloud. system centre, has reported sustained 20-25 kt winds during the last hour. Intensity set at 25kt. Objective aids are not yet available. deep moisture and SSTs are around 29C. to begin weakening over colder waters from Monday 28 January. The next bulletin for this system will be issued by: 23/1330 UTC by Darwin TCWC. Last visible image for the day at 0850. Will see what tomorrow brings. Here's Riley, category 1. Received at 2300UT. And TC Riley is born. I swear if this was an east coast system this thread would be blowing up, but no, we so chill over here. persisted around the system centre overnight and early morning. DT of 3.0. MET is 3.0 based on a D trend and PAT is 3.0. FT based on DT/PAT. Current Intensity is 40 knots [10 min mean winds]. 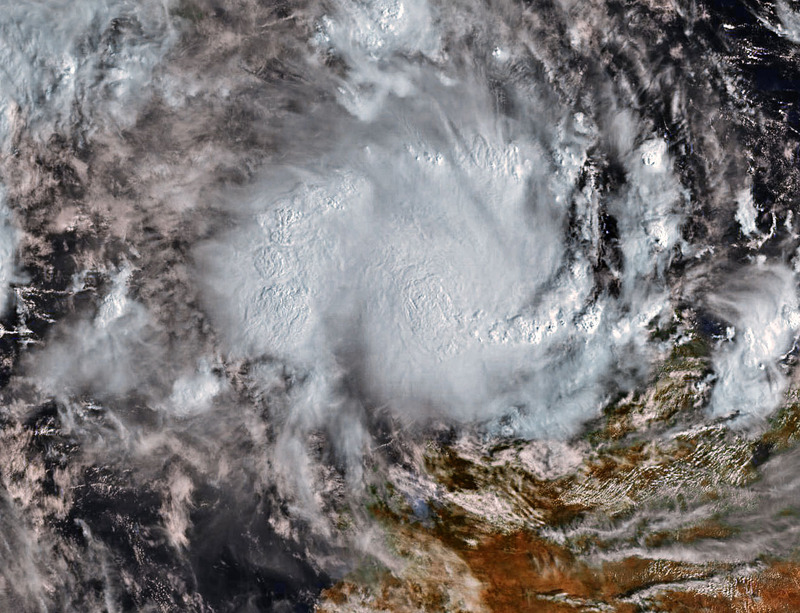 Kimberley coast under the influence of a subtropical ridge over SE Australia. knots. The system is surrounded by deep moisture and SSTs are around 29/30C. The intensity forecast is slightly stronger than the standard development rate. begin weakening over cooler waters from Sunday 27 January and increasing shear. week is expected to maintain a west southwest track in the longer term. The next bulletin for this system will be issued by: 24/0730 UTC by Perth TCWC. [quote=Learjet]Here's Riley, category 1. Received at 2300UT. Such great pics! Starting to look a little more organised now, cant wait to see his structure pull together. We just want some rain on the way past please. Look at him pulling all that moisture down from Indo. Off to the fishies. Cya Riley. I have got to agree with you on the level of interest weathergrrl.The low in the GOC doesn't seem to be generating any interest either.Me thinks it's a NIMBY scene. I think some people just like to read and watch. Maybe mmm 's ( meteorlogical motor mouths) are out of vogue. Also the TC's are in remote areas and no forecast tracking into metropolis areas yet. I was trying to find Riley on the radar . Pretty much the core is just N / west of Broome. Gee very close to the coast. 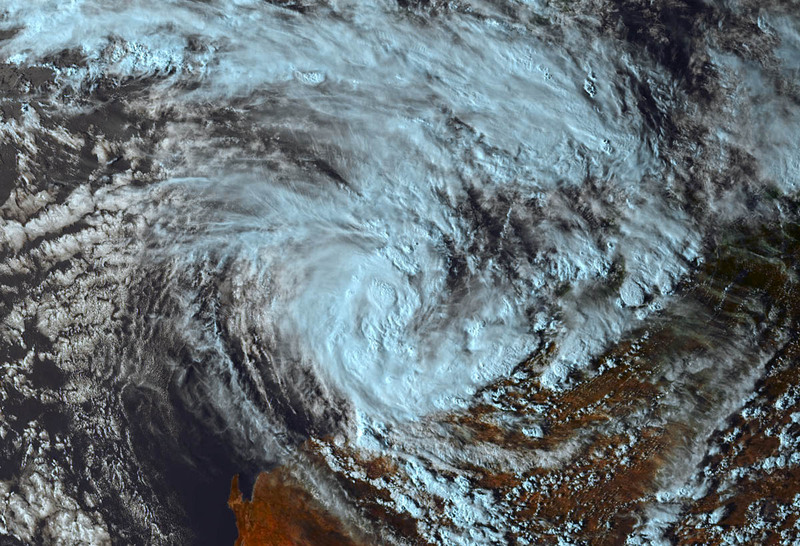 Cyclone Riley from 4am this morning. Himawaricast from Jcsat2B. IR band at 10.4um. Dampier radar has been out for 300+ hours. The work experience kid needs to step aside. 2 registered (snoopydoo, Homer), 60 Guests and 2 Spiders online.